The change log, and the announcement: "Opera 39 goes beta". "Our new beta version brings a new incarnation of the browser VPN, as well as improvements to key features like Opera’s ad blocker, pop out video and personal news feed. We really appreciate your input that has helped us to release so many new features recently. Please keep your comments coming!" Please add back GDI font rendering. I guess you may need to ask Chromium. I tried, they are aholes. I'm sticking with 38.0.2220.25 forever. Well, if Chromium will not change it then it's unlikely that any Chromium based browser will. "Today’s Opera beta update contains a number of fixes, mostly related to VPN, and improving browser stability. Those, who use a lot of extensions, should also be pleased to know, that the extension expander issue has been fixed, and the expander button is back." The Chromium has been updated to version 52.0.2743.41. - The “Recommend” sources are moved from the sidebar to the end of the articles stream and they are directly related to the sources you were reading. - Top50 layout highlights the top articles. - No more stretched images. Also, this beta stability update contains an important fix. All those, who were unable to enter the YouTube full screen mode, when Windows DPI was set to more than 100%, should be happy to know, that the feature works correctly now. Please try out for yourselves. Apart from that, our Opera beta contains a number of other fixes related mostly to VPN, power saver, and the ad-blocking solution. Please refer to the change log for details. As we strive to deliver stability at the earliest stage possible, you should be safely able to use our beta on a daily basis. However, please let us know if you spot any issues; also, please be persistent if you think something requires our attention but we haven’t addressed it yet." – A few OS X minor fixes. The Chromium has been updated to version 52.0.2743.49. "In the Opera beta version, that we release today, most of you will find the same search popup, that was introduced a week ago in the Opera developer release. This one should make the daily routines easier for everyone. As said in the developer release, we have been inspired by mobile platforms, where context menus appear without any additional clicks. So, if you select a text, the popup will appear with the most useful functions – search or copy. Of course, you are in control of this feature and you can turn it off in the Browser / User Interface section of settings. Please note, that there is a batch of A/B testing running at the moment, and that’s why some of you won’t see this popup. To get the version with the popup, all you have to do is reinstall the beta browser on top of your existing one (without losing any data). Other changes include minor UI and stability fixes – please see the change log for details." The Chromium has been updated to version 52.0.2743.60. "Hi, this Opera beta release contains some fixes for the copy/search popup, and improvements in the browser stability. Please find more details in the change log. – Ad blocker information on power saver popup missing, when battery saver mode is on. – With Disqus plugins, scroll to the comment using the id tag does not work." The Chromium has been updated to version 52.0.2743.75. "This is a quick Opera beta update with just a few fixes. Also, Chromium has been updated to 52.0.2743.82. For details, please take a look at the short change log." "Hi, today we’re presenting our stable release candidate of Opera 39. We know that Opera 39 is very much wanted by many of you, so now you can expect that it’s already right around the corner. As usual, we ask you for support – please try it out, and let us know if anything unexpected happens! We are aware of the crash, when a tab with not fully loaded content is dragged out. Should be fixed soon." The change log, and the announcement: "Better video and news experience in Opera for computers". "This year, in our desktop team, we have been focusing on making features we believe need to be part of your browser in 2016. So far we have introduced key new features, such as a built-in ad blocker, and battery saver. 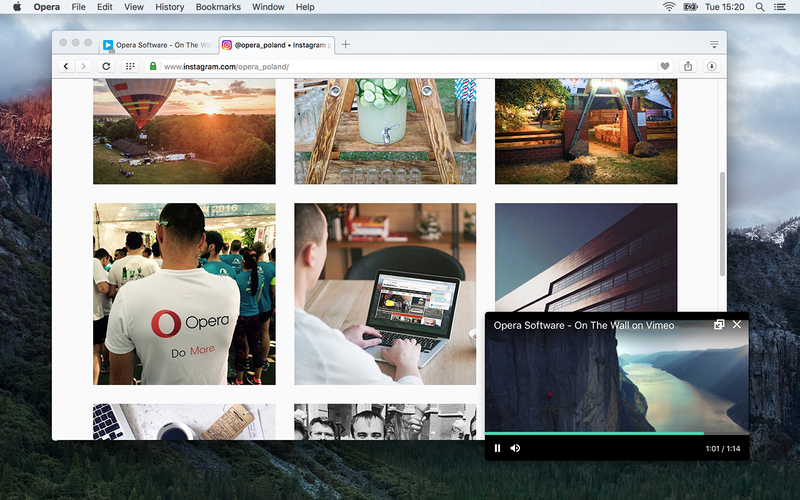 Today, with Opera 39, we introduce a personalized newsreader and a much-improved video pop out feature. The video pop out feature was first released in May and has been polished since then. In Opera 39 we have added several improvements. Now, you can pop out videos from more websites, including Vimeo, and play/pause with a single click. There is also now an option to disable the feature, for those who do not want it. We took a look at some of the usage statistics for video pop out, and it’s unbelievable how many different ways people use this feature. Some of you use it to share your screen with your kids, letting them watch video while you work on other things. Others use it for watching conference recordings, TED talks, online lectures, coding tutorials or extremely long videos (like slow TV). We took a deeper look at how people multitask while watching video in different geographies. The results of this research show online video preferences around the globe based on aggregated and averaged data from Opera 38 usage. The data collected does not include privacy-sensitive data. The top-10 countries span four different continents, showing that the online video boom is truly a global phenomenon. It’s also interesting to see that people in some countries – such as Italy, the UK and Germany – spend much more time watching videos during the weekend, while others, such as China or Spain, tend to multitask more during weekdays. With Opera 39, you can also experience a new way of enjoying news. Go to the start page, and click the newspaper icon on the left. 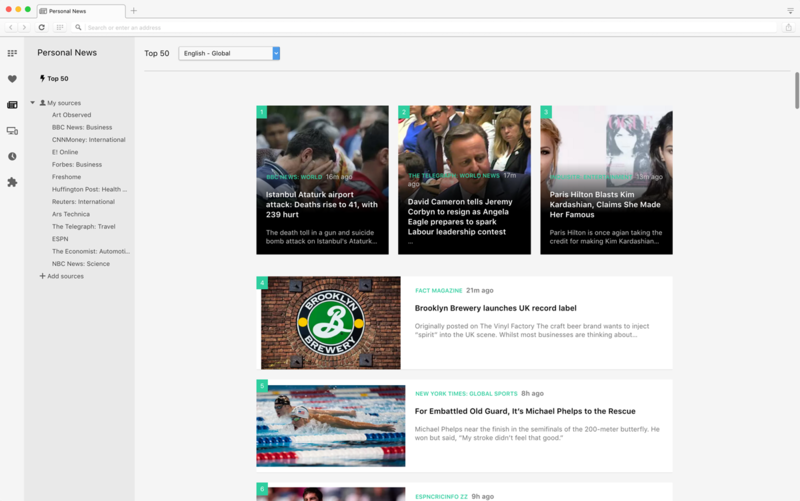 Opera brings you personalized news in our brand new newsreader, with one-stop news tailored just for you. 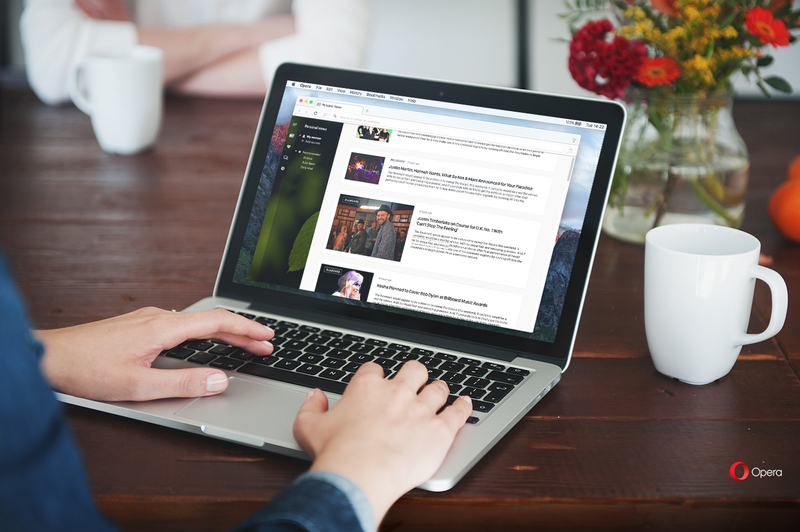 The feature lets you personalize your newsfeed by selecting from favorite news sources, and choose how you would like to display article excerpts and images. There are no ads, and you can mix new sources as you like from different regions and languages. Click“Top 50” in the newsreader side panel to get access to top news picks for a selected country. The “Top 50” is separate from your personal feed, but you can easily add sources you like from it to your feed. Find out how we select top sources for you. We also added a customizable block list to the native ad blocker in Opera 39. With this release, advanced users can now add their own block lists. To find a new list, make a web search for blocking lists recommended for your region; then, copy and paste it into the “Custom block lists” dialog in your preferences. Once added, the browser will start using the list immediately without the need to restart Opera. Another improvement is the search pop-up, that makes searching from the browser easier. If you select text in Opera, a pop-up will appear, offering the most common functions for text selection – search, or copy. This feature can be turned on/off in the Browser / User Interface section of settings. Also, this version brings an optimization pass for the Blink memory manager, called heap compaction. It reduces memory usage by several megabytes per tab. Learn more about how we optimized memory usage in Opera here. This version includes several features for developers, that we inherit from Chrome 52, such as new CSS contain property, which considers fewer elements while rendering, and the PerformanceObserver API, that makes collecting real user measurement data easier. Opera 39 beta features a new, built-in, free and unlimited VPN right in your browser. With the beta version you can now choose whether to use it as a global setting for all tabs, or simply when in private browsing mode. It’s very important for us to polish this option, and make sure we detect and address any severe issues, before it goes stable. You will not find it in Opera 39 stable yet, but we are working hard on this, so stay tuned. This version includes several features for developers as well. Please take a look at the technical details described here. Download Opera 39, and let us know how you like all these changes." New update - Opera stable 39.0.2256.71. The DEB packages are available here. The Chromium has been updated to version 52.0.2743.116.